After peaking in 2013, U.S. net farm income has trended lower over the last five years. This week, we consider how the current slow down has varied across the U.S.
After peaking in 2013, U.S. net farm income has trended lower over the last five years. While national-level data are important and often cited, the impacts of the farm economy slow-down have varied by commodity and geography. Previously we considered how the farm economy boom varied by state. This week, we consider how the current slow down has varied across the U.S. In addition to the national-level net farm income data, the USDA’s ERS also publishes state-level estimates of net farm income. These data, however, are often a year behind. The most current state-level data are 2017. For this post, recent state-level net farm income (the average of 2016 and 2017) was compared to the boom era (the average of 2011 to 2013). To review recent net farm income trend, see our post on national-level farm income. At the national level, net farm income has declined 42% across these two periods. As expected, the Corn Belt and Northern Plains states have been hard-hit by falling farm income (Figure 1). The I-States (Iowa, Illinois, and Indiana) have experiences net farm income falling by nearly two-thirds. On the boundaries of the Corn Belt, state-level farm income has fallen by more than 70% in North Dakota, Minnesota, and Michigan. Outside of the Midwest, the farm economy slowdown has been, generally speaking, less severe. Many states in the South and West have experience farm income changes of less than -50%. The expectations are South Carolina (-66%), Louisiana (-51%), and Nevada (-94%). On the other hand, some states have not experienced farm income declines. Arizona (+20%), Alabama (+10%) and Oregon (unchanged) have not experienced state-level farm income declines for the years considered. Figure 1. 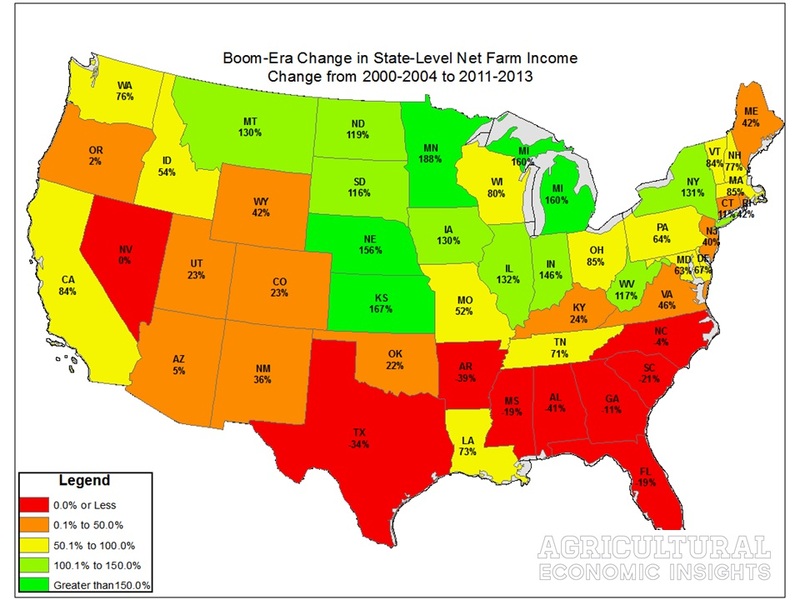 Change in State-Level Net Farm Income (Avg. 2016-2017 vs. Avg. 2011-2013). Data Source: USDA NASS. Again, it is worth reviewing the variations in where the farm economy expansion took place as the trends are similar (specifically here). Recent income declines have generally occurred where farm income growth during the Boom Era was strongest. It can be difficult to capture and articulate the current farm economy slowdown. While there is often lots of timely, robust data for national trends, these broad averages can miss geographic variations and the distribution of the financial challenges. Even state-level data, which help capture some of the variations, doesn’t provide insights on county or farm-level challenges. Just as the impacts of the farm economy vary by state, they also vary across producers. Interested in learning more? Follow AEI’s Weekly Insights by clicking here. Also, follow AEI on Twitter and Facebook.